TNPSC has announced recruitment notification for the post of Civil Services, eligible candidates can submit their application before 09-09-2018. Tamilnadu Public Service Commission, TNPSC Online Applications are invited only through online mode up to 09.09.2018 for direct recruitment to the posts included in Combined Civil Services Examination–II (Interview Posts) (Group-II Services). Examination Fee:- Examination fee for Preliminary Examination Rs.100/- (Rupees One Hundred only) is payable by online through Net Banking/ Credit, Debit card or it can be paid by offline at State Bank of India/ Indian Bank/ Post Office within 2 days from the date of submission of online application by choosing the option in the online application. Name of the Services: Tamil Nadu Industries Subordinate Service. Qualification: A Degree of B.Com or B.A., or B.Sc (Other than in a professional subject not being Agriculture). Name of the Services: Tamil Nadu Defence Subordinate Service. Qualification: A degree of B.A., or B.Sc., or B.Com., of any University or Institution, recognized by the University Grants Commission. B.B.A., of Madurai Kamarajar University or B.Litt., of Madras University or B.B.M., or B. Litt., of Bharathiyar University. Name of the Services: Tamil Nadu General Subordinate Service. Qualification: A degree in Arts or Science or Commerce or B.O.L., of Annamalai University or B.B.A., of Madurai Kamarajar University or B.Litt., of Madras University or B.B.M., or B.Litt., of Bharathiyar University. 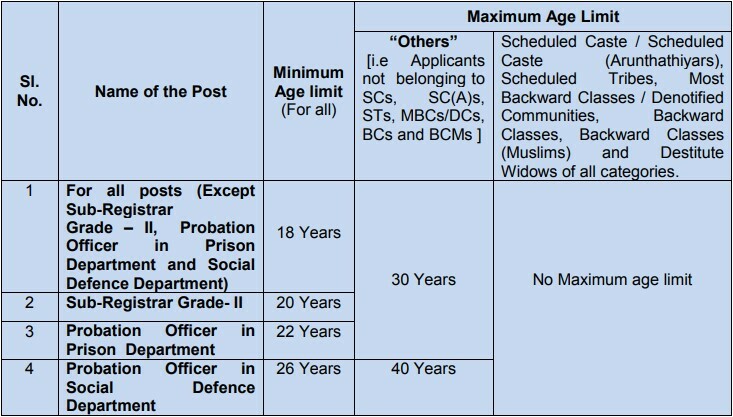 Name of the Services: Tamil Nadu Jail Subordinate Service. Qualification: A degree of B.A., or B.Sc., or B.Com., or B.O.L., of Annamalai University or B.B.A., of Madurai Kamarajar University or B.Litt., of Madras University or B.B.M., or B. Litt., of Bharathiyar University. Name of the Services: Tamil Nadu Labour Subordinate Service. Qualification: A degree in Arts or Science or Commerce or Engineering or B.O.L., of Annamalai University or B.B.A., of Madurai Kamarajar University or B.Lit., of Madras University or B.B.M., or B.Litt., of Bharathiyar University. Name of the Services: Tamil Nadu Registration Subordinate Service. Qualification: A Bachelor’s degree from any university or Institution recognized by the UGC for the purpose of its grant. Name of the Services: Tamil Nadu Ministerial Service. Qualification: Any Degree and Technical Qualification. Must have passed the Government Technical Examination in Typewriting both by Higher / Senior Grade in Tamil and English. Name of the Services: Tamil Nadu Municipal Commissioner Subordinate Service. Qualification: A Degree of any University or Institution recognized by the University Grants Commission. Name of the Services: Tamil Nadu Secretariat Service. Qualification: B.L., Degree awarded by any University recognized by the University Grants Commission. A Bachelor’s Degree in Commerce or Economics or Statistics with a pass in the final examination of the ICWAI. Name of the Services: Tamil Nadu State Legislative Assembly Secretariat Service. B. Litt., of Bharathiyar University. (iii) A Bachelor’s Degree with first 11 class in any one of the parts. Provided that in the case of a candidate belonging to SC, SC(A), ST, MBC/DC, BC (Other than BCM) and BCM it shall be sufficient if he/ she holds a Bachelor’s degree. Master’s degree in Science (Information Technology/ Computer Science). P.G. Diploma in Agricultural Economics and Co-operation awarded by the National Council for Rural Higher Education. B.B.M., or B. Litt., of Bharathiyar University. Name of the Services: Tamil Nadu Local Fund Audit Subordinate Service. Name of the Services: Tamil Nadu Handlooms and Textiles Subordinate Service. ii) A diploma in Handloom Technology or Textile Technology or Textile processing or Manmade Fibre Technology awarded by the State Board of Technical Education and Training in Tamil Nadu. Name of the Services: Tamil Nadu Co-operative Subordinate Service. A Diploma in Rural Services awarded by the National Council of Rural Higher Education. A Diploma of Associate Member of the Institute of Chartered Accountants. Name of the Services: Tamil Nadu Agricultural Marketing Subordinate Service. Name of the Services: Tamil Nadu Town Panchayat Subordinate Service. Qualification: Degree of any University or Institution recognized by the University Grants Commission.